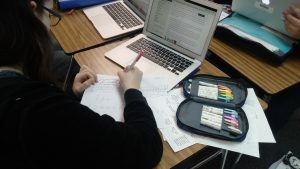 At Carlisle School, a great deal of learning takes place outside of the textbook, and faculty strive to present curriculum in a way that is engaging and interesting to their students. 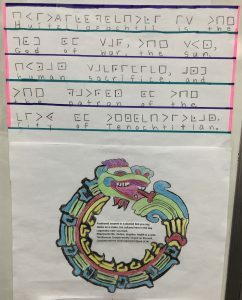 For Middle School students in Damian Dydyn’s 7th-grade geography class, a recent project on Mesoamerica challenged the students to think creatively. 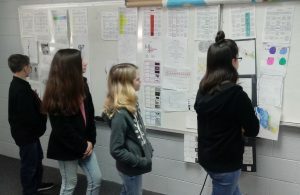 Dydyn, who is in his first year at Carlisle, presented his students with a Bingo Board which contained 24separate projects about Mesoamerican culture. Much like the game of Bingo, students were asked to fill in five squares on the board either horizontally, vertically, or diagonally. Projects included writing a poem, designing a map, describing native dances, role-playing important events, and more. For each project, the students could choose to discuss the Olmecs, Mayans, Aztecs, or Incas. They were given one full week to select their desired tasks, conduct the research needed, and complete each project. The class enjoyed the assignment. According to Cole Abercrombie of Danville, “I liked this project because it wasn’t necessarily assigned to us, but we got to choose what we wanted to do. I also liked the project because they were shorter but multiple instead of one big project.” Going above and beyond in effort was rewarded as students who selected an optional sixth square to complete were able to earn extra credit for the class. The projects allowed the students to be as creative as they wished. Victoria Shelton of Danville selected the square for drawing an ad enticing citizens to come to join her civilization and brought that concept to fruition as a real estate brochure and a yard sign for an open house. The original leaflet highlighted the village’s recreation center, ball courts, firepit, and aqueducts as selling features. 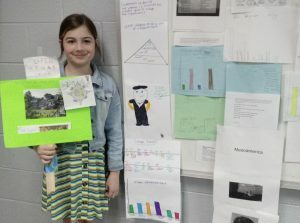 Once the projects were completed, they were displayed, and all students presented their work to their classmates to share the knowledge gained. The projects will remain on display in the Roy Building for other students and guests to view. Carlisle School is currently enrolling new students for the 2019-2020 school year and has academic scholarships available for new students entering grades 6th, 9th, and 10th.